PREMIUM ESSENTIAL OILS FROM MOOKA – Contains 6 bottles (10ml/bottle) of the most popular essential oils on the planet, such as lavender oil, tea tree oil, lemon oil, provides multiple aromatherapy healing, cleansing, and fragrance benefits. Perfect for home Diffusers, Humidifiers use. Or use as Massage and Body Oils for Spa at etc. 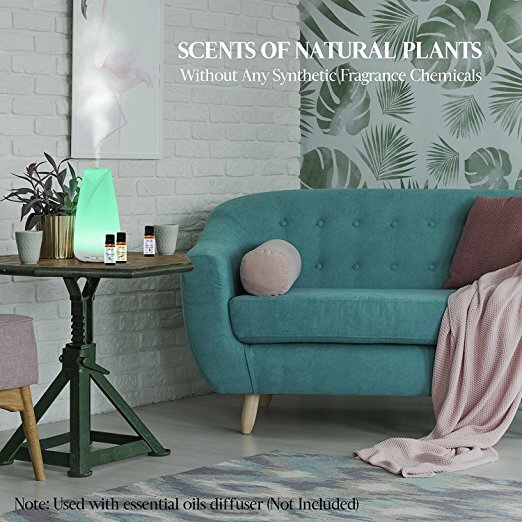 SMELL OF NATURE – We are proud that our essential oils are 100% pure plants extract in-sourced all over the world and bottled in the USA without adding any synthetic fragrance chemicals. They are the scents of natural plants, unlike other brands’ essential oils smell terrible when just open the package. 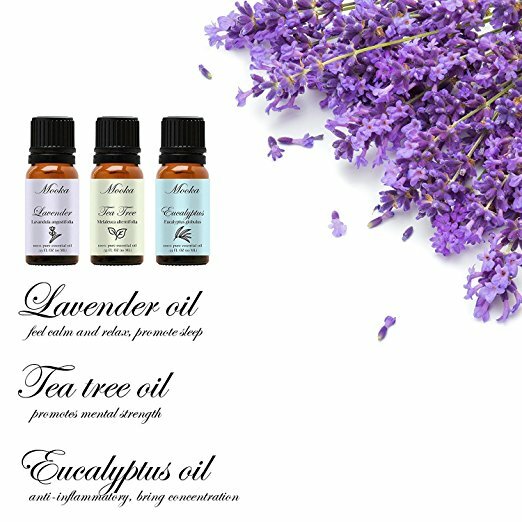 THERAPEUTIC GRADE OILS – Lavender helps with cognitive functions and alertness; Lemongrass yields calmness and clarity; tea tree promotes mental strength and calmness; Peppermint stimulates concentration and clear thinking; Orange promotes optimism and peace; Finally, Eucalyptus brings about optimism and concentration. MAGICAL BLENDS EFFECTS – With Lavender, Tea Tree, Eucalyptus, Lemongrass, Sweet Orange, Peppermint. 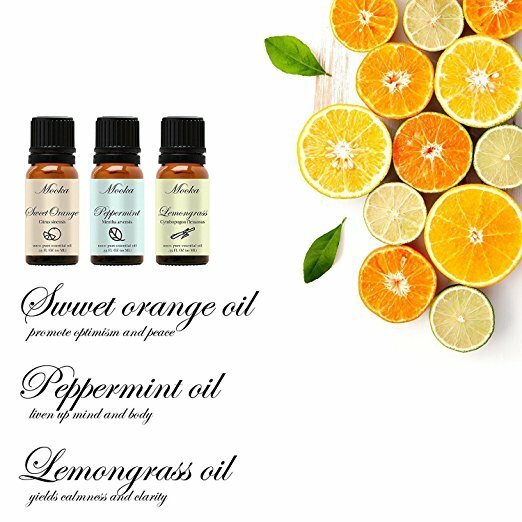 You can choose to use these oils separately (external use only), or try to motivate your emotion to blend them together and make your own special aromatherapy oils, that would be incredible. HIGHEST QUALITY GUARANTEED – All Essential oils from Mooka are bottled in FDA certified facilities in the US. Mooka Customer Service Promises 100% Money Back if you are unsatisfied with Mooka Essential Oils in any way. So just take it away with 100% pride and confidence! Top 6 Essential Oil Set: Contains 6 bottles (10ml/bottle), Lavender, Tea Tree, Eucalyptus, Lemongrass, Sweet Orange, Peppermint, which are the most popular essential oils on the planet. Smell of Nature: You know that our essential oils are 100% pure without adding any synthetic fragrance chemicals. They are the scents of natural plants, unlike other brands’ essential oils smell terrible when just open the package. 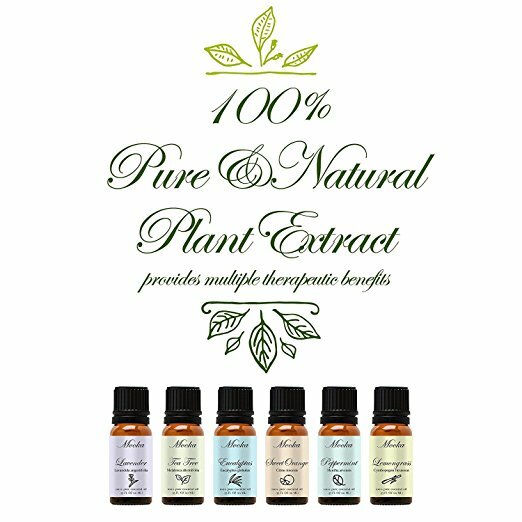 Therapeutic Grade: Firstly, you must know that essential oils must be pure plant extracts to have a therapeutic effect. Adulterated oils or perfume oils won’t offer therapeutic effects and may cause allergies, headaches and chemical sensitivities. Essential oils from Mooka are 100% pure, offer multiple aromatherapy healing, cleansing, and fragrance benefits. 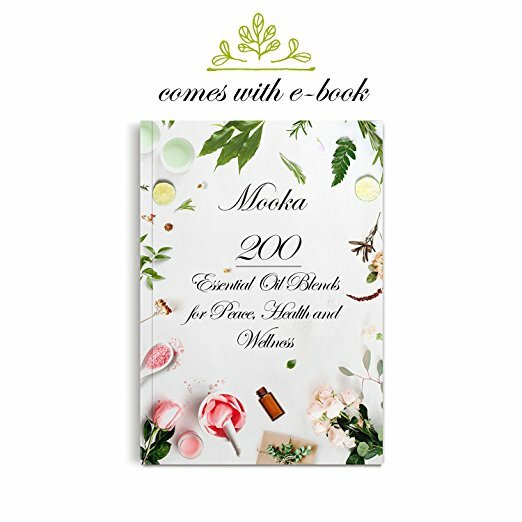 Mooka Guarantee: 100% Money Back Guarantee.If you are unsatisfied with our essential oil set in any way, just contact Mooka Customer Service for replacement or refund, we are always online.